Instances of melanoma, the most deadly of skin cancers, are increasing faster than any other form of cancer. Surprisingly, one of the leading places cancer is commonly being found these days is on the feet. That’s right, foot melanoma is the deadliest cancer. Unfortunately, survival rates are dramatically lower when melanoma is found on the foot. For one reason, it often goes unnoticed until there is a serious problem. When not caught in the early stages the fatality rate is about 50% within 5 years of diagnosis. The next time you trim your toenails, give your feet a good inspection. Check any moles or discolored patches looking for changes. And don’t forget your toenails! Yes, melanoma skin cancer can form underneath your toenails. If you’re in your 50s or older, make checking your feet a regular routine — because this is the prime time for melanoma to develop. Men and women are equally at risk of getting skin cancer on their feet. Some of the risk factors include being Caucasian, having light skin and blue eyes. Pay special attention to the soles of your feet, and be suspicious of any mole or freckle found on the sole of your foot. Not all are cancerous. However, according to dermatologists, moles and freckles are not commonly seen on the soles of the feet. So if you spot one, it should be checked out immediately — because they tend to spread quickly, grow rapidly, and often result in death. Unfortunately, the same time you enter the age group where risk of foot melanoma increases, flexibility also starts to diminish — making it harder to closely inspect all angles of your feet. Using mirrors can be helpful when inspecting parts of the body that you can’t adequately see. If aging eyesight is a problem, invest in a large magnifying glass to help bring certain areas into focus. If you need to, ask your spouse or partner to inspect the parts you can’t see. Foot melanoma needs to be taken seriously. Melanoma is the most common skin cancer found on the feet and ankles. In fact, malignant melanoma is occurring more often now than at any time in past history. With 40,000 new cases discovered every year, regular self-examination is imperative in order to catch this deadly cancer early. As a preventative measure, when you apply sunscreen don’t forget your feet — not just the tops, but also between the toes and on the bottom of your feet as well. Sandals, flip flops, and all forms of open-toed shoes have been linked to skin cancer of the feet. Your feet spend the largest part of their lives encased in shoes that shield them completely from the sun. However, once summer arrives, suddenly your feet are thrust out into full-strength sunlight. Just as a serious sunburn obtained as a child can be the root cause of skin cancer as an adult, any intense exposure to the sun that your feet receive can also increase your risk of getting skin cancer on your feet. Any suspected skin cancer or melanoma should be examined immediately. It’s all that more important when the feet are involved. Vigilance in self-examinations coupled with quick action when something suspicious is found is your best chance for a long healthy life. 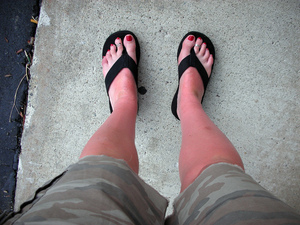 Don’t let this happen to you by neglecting the signs of foot melanoma.